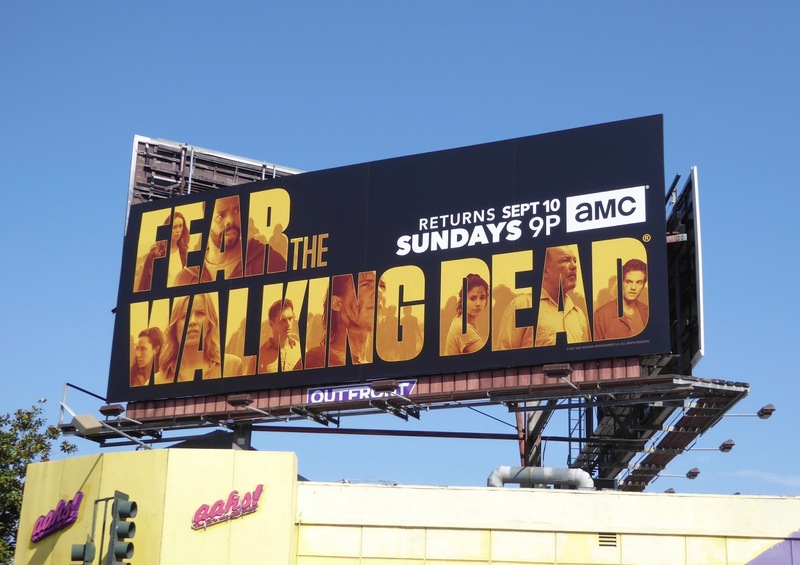 Just as The Walking Dead has finished its brutal seventh season, its companion spin-off series, Fear the Walking Dead, is about to shamble onwards with its third bloody season. 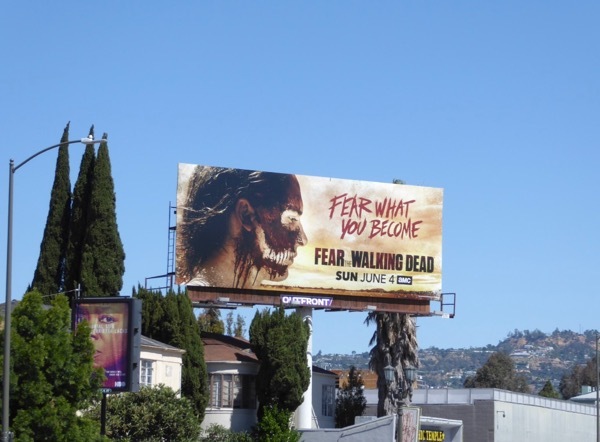 Telling the story of the zombie apocalypse from a different perspective than the parent show, FTWD has slowly moved from its L.A. origins at the beginning of the outbreak and seen the blended family escape by boat to Baja in Mexico and be forced apart. 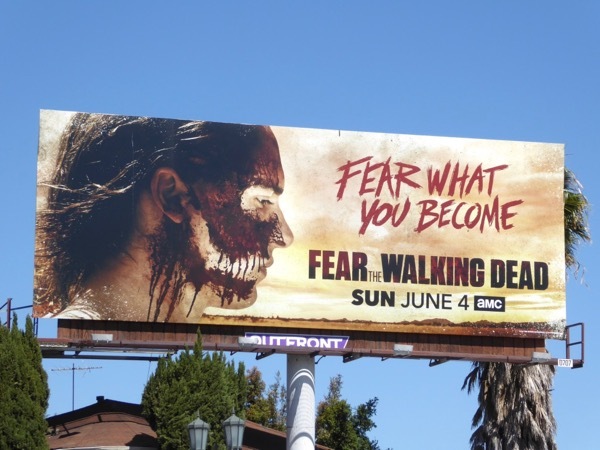 Kim Dickens 'Madison' and Cliff Curtis 'Travis' have come a long way from working at a school and living together, and after losing his son last season, they now know they've do whatever needs doing to protect their remaining family from the undead and the living, regardless of what they may become through the choices they make and actions they take. 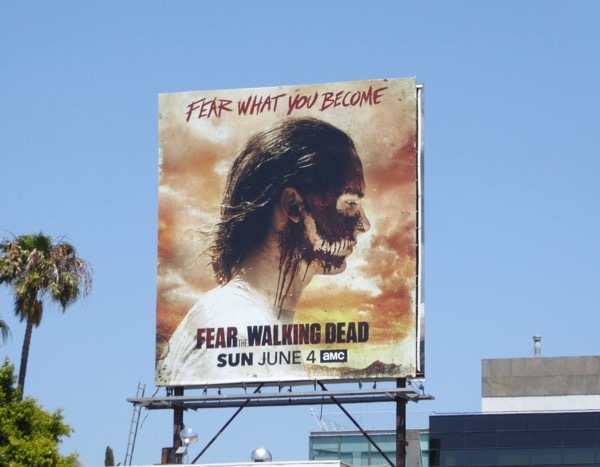 At the end of season two they were almost reunited with Madison's recovering drug addict son 'Nick' (Frank Dillane), who has a penchant for smearing himself in the blood and gore of the dead to walk amongst them. 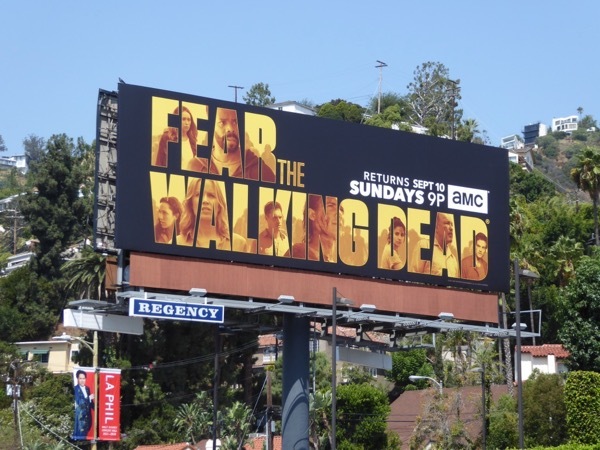 Let's see if all Fear the Walking Dead's survivors can make it through a third season when faced with new threats, walkers, militias and more violent groups trying exist in this world gone mad. 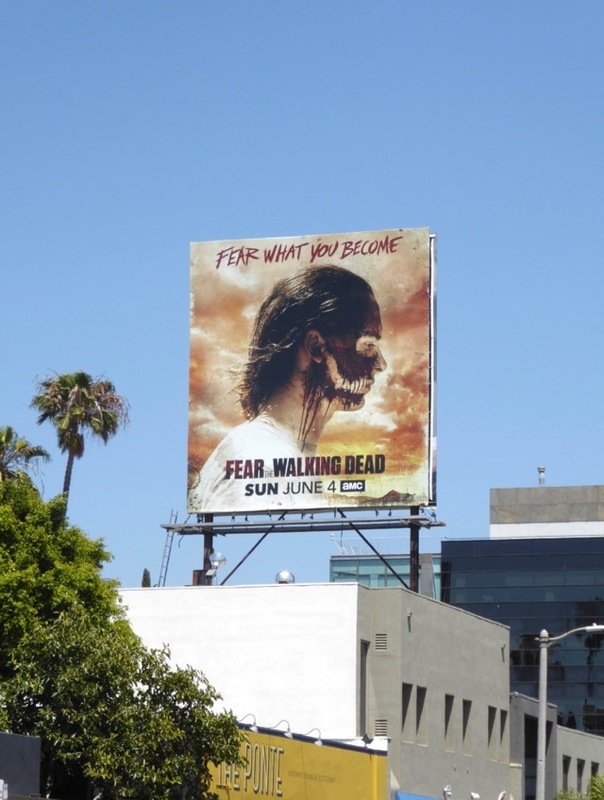 This ad creative really stand outs with fan-favorite Nick's face smeared with blood in a skull-like visage, or looking like a creepy clown straight out of a horror movie. 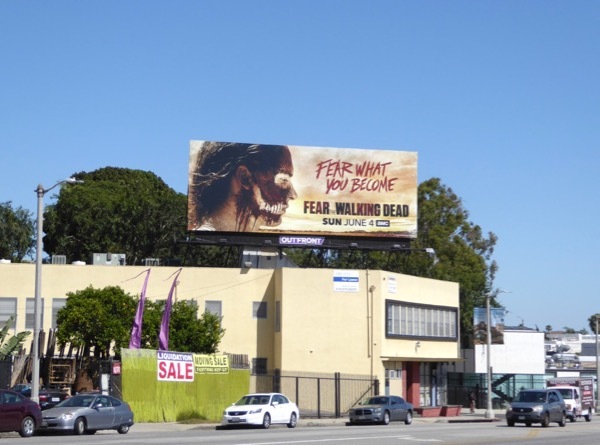 These eye-catching landscape season three billboards were spied along La Cienega Boulevard and La Brea Avenue on May 13, whilst the square versions were spotted above Beverly Boulevard and Santa Monica Boulevard on May 18, 2017. 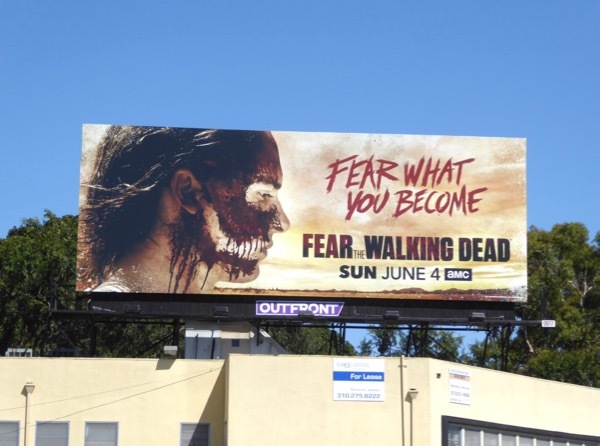 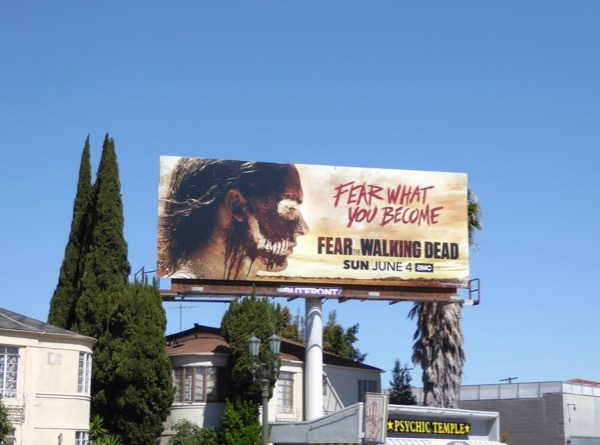 Fans of the AMC show can also enjoy these season one and two billboards for Fear the Walking Dead. 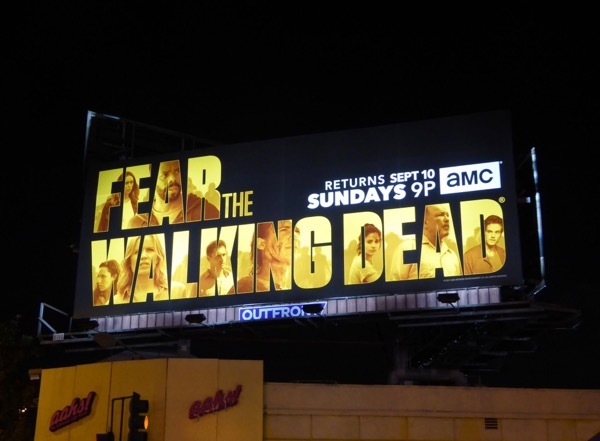 We've seen what 'Rick Grimes' and his friends have been willing to do to survive in this apocalyptic world, now it's time to see what these characters are capable of when it comes to battling zombie hordes and gun-wielding antagonists to protect their family. 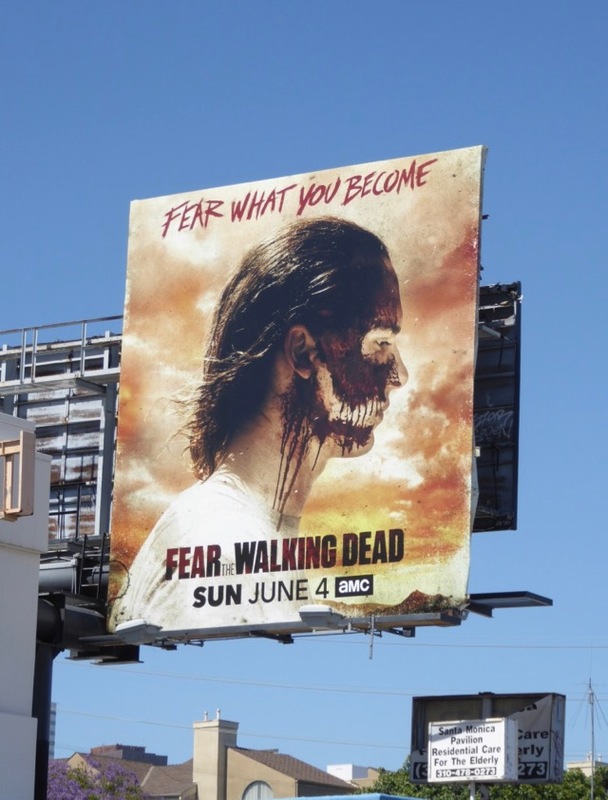 UPDATED: For the second part of the third season of FTWD the whole gang is represented in the show's key art. 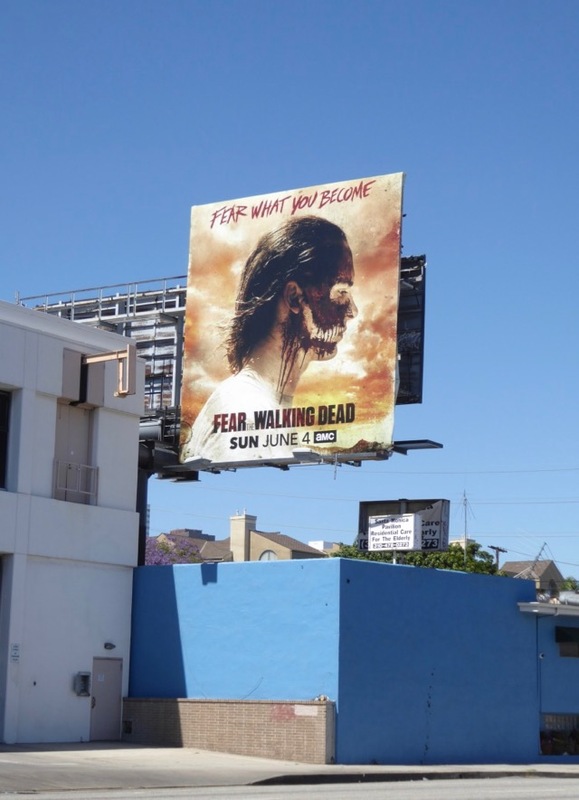 This billboard design, which reminds Daily Billboard of the sixth season promo billboard for The Walking Dead, looks good by day and night and was snapped in multiple locations along the Sunset Strip on August 31, 2017, and the next day. 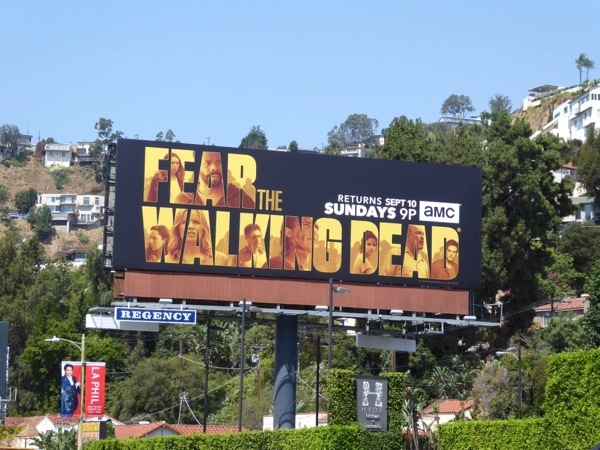 The real question now is, when all the family members and friends are reunited, who will survive to fight another day in the fourth season?